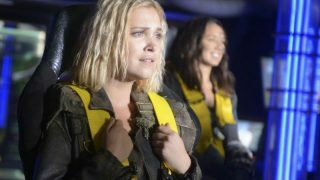 Comic-Con rolls on this week in San Diego with news and video from all our favorite shows that are returning in the fall. Next up is The Walking Dead, as AMC released the first trailer for the seventh season of the show. Watch it below. The 3-minute video starts with a drawn-out tease of the identity of Negan’s (Jeffrey Dean Morgan, now a regular cast member) victim, causing fans to wonder if the first episode of Season Seven will stick to Robert Kirkman’s comics or go its own way in who will die next. Will it be a long-time favorite like Daryl, Glenn, or Maggie? or a newer supporting player such as Aaron, Abraham, or Eugene? The rest of the trailer studiously avoids showing any of those possible victims in new footage, focusing instead on walkers, Negan’s band, Carol and Morgan, and Tara. 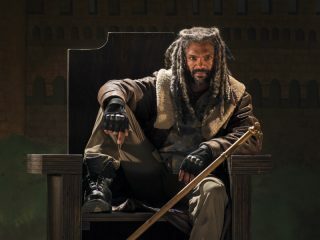 We also get an intro to a new group of potential allies against Negan in the form of “The Kingdom,” complete with the introduction of a major character from the comics: King Ezekiel, played by Khary Payton (Young Justice, Teen Titans), who is also reportedly a series regular. And yes, there’s a tiger. The network released the first photo of Ezekiel (above – click to enlarge) under the label of “Episode 3,” which might mean that the November 6 episode will be his first appearance. AMC also announced today that The Walking Dead will return on Sunday, October 23 (9/8c). (That’s about a week later than has been typical.) AMC’s Talking Dead, hosted by Chris Hardwick, will follow at 10/9c. Eight episodes will air in the fall, with another eight starting in February. Meanwhile, spin-off Fear the Walking Dead returns August 21 with the second half of its second season. Stay with SciFi Stream for more!